Osteoporosis is a systemic skeletal disease characterized by reduced bone mass and deterioration of bone tissue architecture. This results in bone fragility and susceptibility to fractures. 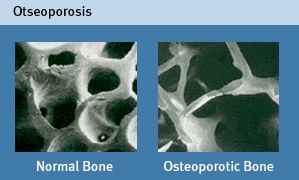 Osteoporosis affects 100 million people worldwide and 28 million people in the United States are at risk. Each year there are 1.5 million fragility fractures in the United States. Of these, 700,000 occur in the spine, 300,000 in the hip, 250,000 wrist and 250,000 are in other bones. According to the National Osteoporosis foundation, the projected cost of treatment of this disease in the United States in 2030 is $60 billion dollars. Spinal vertebral compression fractures are the most common fracture due to osteoporosis. In the United States, there are 700,000 compression fractures each year, or one compression fracture each 45 seconds! A quarter million patients with their first painful fracture are diagnosed each year. After patients suffer one compression fracture, the risk increases for subsequent fractures 5-fold. Vertebral compression fractures present with the sudden onset of back pain with little or no trauma. It may be the first sign of osteoporosis. The vertebra collapses and the spine shortens and tilts forward. Like any bone fracture it hurts. When osteoporosis is left untreated, multiple spinal compression fractures may occur over time. Patients experience episodic and recurrent back pain. Multiple fractures cause collapse and a forward tilt of the spinal column as depicted in the skeleton below. The physical impact of multiple compression fractures can be seen in these pictures below. The patient is depicted at age 50 and 75. Spinal collapse due to the compression fractures gives the false impression that the patient’s head becomes oversized with age. At 75, the patient has developed a typical Dowager’s hump or spinal deformity. In addition to these obvious external changes, these fractures reduce quality of life for the elderly. Fractures adversely affect lung function, sleep and appetite. Visit our site at www.spinefracture.org to learn more.